This dataset contains monthly mean ocean surface physical and biogeochemical data for the Gulf of Mexico simulated by the South Atlantic Bight and Gulf of Mexico (SABGOM) model on a 5-km grid from 2005 to 2010. The simulated data include ocean surface salinity, temperature, dissolved inorganic nitrogen (DIN), dissolved inorganic carbon (DIC), partial pressure of CO2 (pCO2), air-sea CO2 flux, surface currents, and primary production. 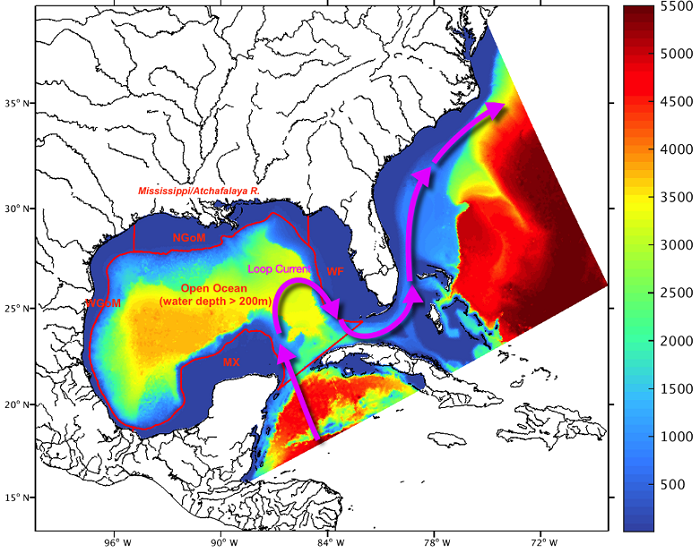 The SABGOM model is a coupled physical-biogeochemical model for studying circulation and biochemical cycling for the entire Gulf of Mexico to achieve an improved understanding of marine ecosystem variations and their relations with three-dimensional ocean circulation in a gulf-wide context. The dataset has eighteen netCDF files, with two files per year for the surface current data and one file per year containing all other variables. Figure 1. Domain of the South Atlantic Bight and Gulf of Mexico (SABGOM) model with water depth in color (unit: m). For analysis, the GOM was divided into five subregions used in this study, which are Mexico Shelf (MX), Western Gulf of Mexico Shelf (WGoM), Northern Gulf of Mexico Shelf (NGoM), West Florida Shelf (WF), and open ocean. Also shown is a schematic for the Loop Current (Xue et al., 2016). The dataset has eighteen netCDF files; three files for each of the six years. The surface current data is provided in two files for each year (described in Table 1) and all other variables are provided in a single file (*_rho.nc4) for each year. The surface current data were separated from the other variables because they use different coordinate systems and extents. See Xue et al. (2016) for more information. Table 1. Data file names and descriptions. In each filename, XXXX represents the year, ranging from 2005 to 2010. Sabgom_output_XXXX_rho.nc4 Six files with data for air to sea CO2 flux, DIC, DIN, PP, and ocean surface measurements for pCO2, salinity, and temperature. Sabgom_output_XXXX_u.nc4 Six files with data for ocean surface currents U: east-west component. Sabgom_output_XXXX_v.nc4 Six files with data for ocean surface currents V: north-south component. Fill value and missing values are -9999 for all files. The South Atlantic Bight and Gulf of Mexico (SABGOM) model is a coupled physical-biogeochemical model for studying circulation and biochemical cycling for the entire Gulf of Mexico to achieve an improved understanding of marine ecosystem variations and their relations with three-dimensional ocean circulation in a gulf-wide context. These data could be useful to climate change studies and marine carbon cycle studies. Modeled data were validated against ship-based measurements from sea surface pCO2 database compiled by the Lamont–Doherty Earth Observatory, > 180 000 data points in the Gulf over 2005–2010, (Takahashi et al., 2015), and ship-based measurements (> 78 000 data points) from Huang et al. (2015). For the analysis, the GOM was divided into the five subregions: Mexico Shelf (MX), Western Gulf of Mexico Shelf (WGoM), Northern Gulf of Mexico Shelf (NGoM), West Florida Shelf (WF), and open ocean. The data points falling in each of the subregions was first grouped by a 10-day temporal binning and then spatially averaged to get a mean value for each subregion. Agreement between model and observations was better during spring, fall, and winter, than during summer. The model overestimated pCO2 in June 2006, August 2007, and July 2009. Refer to Xue et al. (2016) for additional details. The Gulf of Mexico (GoM) receives enormous riverine nutrient and carbon inputs, the majority of which are from the Mississippi–Atchafalaya River system. The carbon cycling associated with such enormous terrestrial carbon and nutrient inputs remains unclear. Excessive nutrient loading causes coastal eutrophication, which triggers the well-known hypoxia phenomenon and an acidification problem. Further offshore, the circulation in the GoM is largely influenced by the energetic Loop Current (Xue et al., 2016). The carbon cycle parametrization used in this study followed the same approach and values as in Fennel et al. (2008), Fennel and Wilkin (2009), and Fennel (2010). Gas exchange calculations followed the formulas in Wanninkhof (1992). pi2 is a constant set to 6.28, D0= 375.96, D1= 2.23, D2= -0.007, D3= 1.31, D4= -0.64, D5= -0.13, and D6= 0.21. Due to the relatively low horizontal resolution of the AIRS data (2.5×2 degrees), air pCO2 was set to be spatially uniform. To account for riverine inputs, a climatological monthly alkalinity time series was constructed by averaging all available US Geological Survey (USGS) observations for each major river, including the Mississippi, Atchafalaya, Mobile, and Brazos in the GoM. Because direct riverine DIC measurements were not available, riverine DIC inputs using the corresponding alkalinity value plus 50 were approximated (Xue et al., 2016). The model outputs provided in this data set are the monthly mean ocean surface physical and biogeochemical data for the Gulf of Mexico on a 5-km grid from 2005 to 2010. The simulated data include ocean surface salinity, temperature, dissolved inorganic nitrogen (DIN), dissolved inorganic carbon (DIC), partial pressure of CO2 (pCO2), air-sea CO2 flux, surface currents, and primary production. AIRS Science Team: AIRS/Aqua L3 Monthly CO2 in the free troposphere (AIRS+AMSU) 2.5 degrees × 2 degrees V005, version 005. 2008. Greenbelt, MD, USA, Goddard Earth Sciences Data and Information Services Center, GES DISC. Aulenbach, B.T., H.T. Buxton, W.T. Battaglin, and R.H. Coupe. 2007. Streamflow and nutrient fluxes of the Mississippi-Atchafalaya River Basin and subbasins for the period of record through 2005, US Geological Survey Open-File Report 2007-1080. Fuentes-Yaco, C., D.A.S. de Leon, M.A. Monreal-Gomez, and F. Vera-Herrera, F. 2001. Environmental forcing in a tropical estuarine ecosystem: the Palizada River in the southern Gulf of Mexico, Mar. Freshwater Res., 52, 735–744. Milliman, J.D. and K.L. Farnsworth. 2011. River discharge to the coastal ocean: a global synthesis, Cambridge University Press, Cambridge, New York, 384 pp.